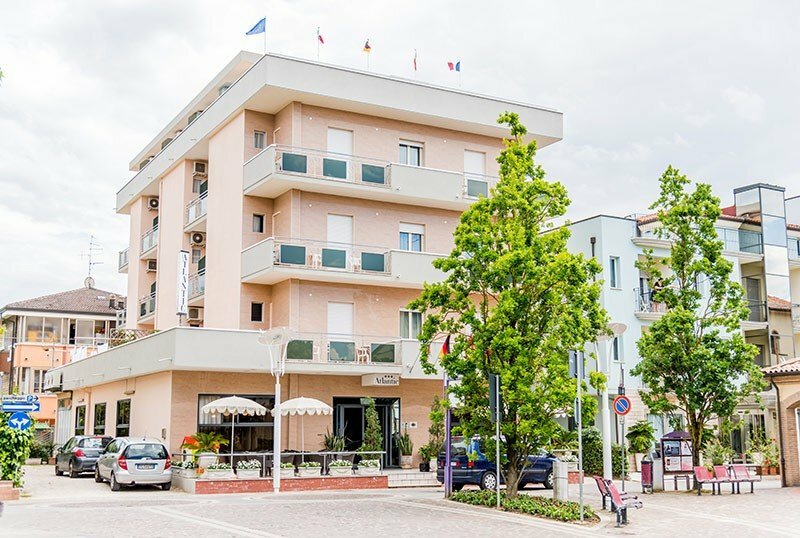 The Hotel Atlantic , 3 stars of Igea Marina, with free parking, WI-FI connection throughout the entire hotel, air conditioning in the room. Admits small animals. The Hotel is centrally located in the heart of Igea Marina, a seaside resort north of Rimini. Near the beach and the Gelso park with children's playgrounds and paths for walking and jogging. The rooms have a balcony or terrace (some rooms with sea view, others overlooking the boulevard of the village), independent air conditioning, WI-FI, LCD TV with satellite channels, safe, telephone, fully renovated bathrooms with shower, hairdryer and courtesy kit. The hotel has a terrace, solarium, lift, reading room with newspapers available, free use of bicycles (also with child seats). PARKING: outdoor video surveillance, limited places. CONVENTIONS: beach, amusement parks, gym. BREAKFAST: sweet and savory buffet with a wide selection of brioches, biscuits, cakes, jams, yogurt, fruit, cheese, eggs and cold cuts. LUNCH AND DINNER: menu with 3 or more choices, vegetable buffet, desserts, ice cream, desserts and homemade sorbets. Water included. In hotel: strollers, indoor and outdoor playground area, toys, library. In the room: cots, bed rails and baths. With meals: flexible hours, refrigerator available for milk and perishable food, bottle warmers, bottle-washing service, high chairs, footrests and the kitchen is also available to prepare baby food and dishes on request. Full Board Packages + water and wine with meals and Beach Service, minimum stay 7 nights, prices per person. The promotions are valid until 04/30/2019, with payment of a deposit. Special weeks of relaxation in June at Igea Marina! starting from € 350 per person. 1 child up to 10 years FREE, (in room with 2 adults) the second discount of 50%. from € 490, 1 child up to 10 years FREE, the second with discounts on the price list. At Easter and Spring Bridges we look forward to seeing you at the Atlantic! Offer valid until sold out, contact us now! START JUNE SPECIAL FAMILY: BOOK BY 30 APRIL! Week of relaxation from 15 to 27 July, full board with water and wine with meals and beach service (1 umbrella and 2 sun beds). From € 430 per person for 7 days. 1 child up to 10 years FREE, (in room with 2 adults), the second child 50% discount. Offer valid only for bookings before April 30th. SPECIAL JULY IF YOU BOOK BY 30 APRIL! Weekly full board package with water and wine with meals and beach service (umbrella and sun loungers on the beach). From € 499.00 per person for 7 days. 1 child up to 10 years FREE, (in room with two adults), the second child 50% discount. Offer valid only for bookings made before April 30th. Contact us for a tailor made quote.